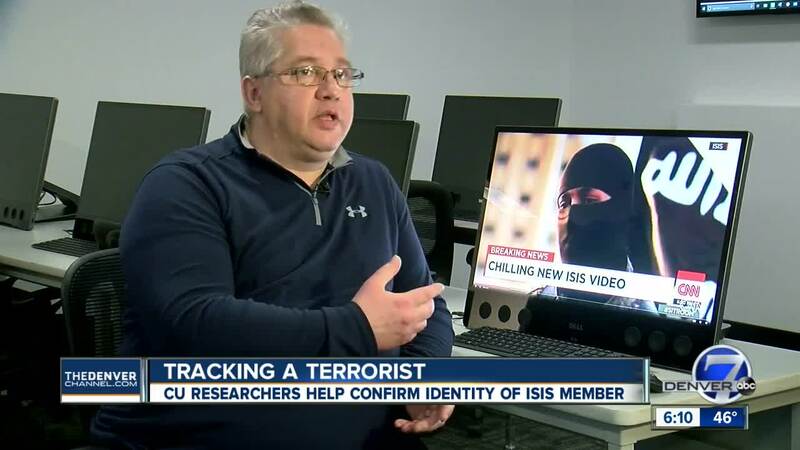 DENVER -- Scientists at the University of Colorado Denver are using highly technical forensics to help identify terrorists. The school’s National Center for Media Forensics recently helped the New York Times independently confirm the identity of a war criminal who claimed to be the narrator in a series of ISIS propaganda videos and recordings. In the video, the masked English-speaking narrator gloats about the capture of Syrian fighters. "And we're here with the soldiers of Bashar,” the masked-man says. “You can see them here - digging their own graves in the very place where they were stationed." The New York Times reached out to scientists here in Denver to help identify the ISIS militant. "We specialize in analyzing that material and determining where it came from," said Jeff Smith, director of CU Denver’s National Center for Media Forensics. "The process that we apply is highly technical." 35-year-old Mohammed Khalifa, who partially grew up in Toronto, Canada, claims to be the ISIS narrator. Khalifa made the claim from a Syrian jail where he is being held. He was captured earlier this year by an American-backed militia. The video was released in 2014 and became known as "the flames of war." "And the flames of war are only beginning to intensify," the narrator is heard saying. The video became a recruiting device for ISIS, particularly in Australia, Britain and North America, according to the recent NYT article. The masked narrator appeared in dozens of ISIS propaganda videos, including the video where captured Syrian fighters are forced to dig their own graves before they're shot in the head, execution-style by ISIS fighters. "We are contacted from time to time by journalists who are in need to verify their sources or verify the authenticity of material that they've been provided," Smith said. Smith and his team analyzed digital evidence from the execution video, plus other samples from various suspects to determine the identity of the ISIS militant who appears to speak perfect English in a North American accent. "It is possible to identify the speakers even when they switch from English to Arabic,” said Catalin Grigoras, an associate professor and the lead researcher on this project at CU Denver. Through a series of scientific vocal analysis tests, researchers conclude the man in the video is 134 times more likely to be Khalifa than anyone else. "The likelihood ratio was high enough to support the hypothetic that they are the same speaker," Grigoras said of the video in question and known samples from Khalifa his team also analyzed. "It's extremely important for (our conclusions) to be accurate," Smith said. CU Denver receives federal funds from the Department of Justice and has become a world-class facility and master’s program for training in multi-media forensics. “Forensics is obviously a huge impact to citizens and our national security," Smith said. In this case, the team at CU Denver helped to identify Khalifa, who is believed to be the first North American ISIS fighter to commit a war crime on camera, according to various media reports. "(We are) confident enough to say that they are the same person," Smith said. Khalifa is now in a Syrian jail. In an Interview with the New York Times, he said he has no regrets.